CC said: I think that I'm bad at explaining this stuff, because I've been so deep in the theory for so long that I have long since forgotten the point of entry. So I don't know what pieces I have to supply to people so that they'll get it, the same way I do. But here's an analogy that might help. Actually, I thought you explained it well, other than a few odds and ends, that I wanted to try to understand too. Imagine standing on a steel deck. Now imagine that some hot, positively charged air has been manufactured. This electric charge will induce an opposite charge in any nearby conductor, and thereafter be attracted to it. Thus the positively charged air will induce a negative charge in the surface of the steel deck, and then the air will be pulled down to the deck by the electric force. How does the body of air get a positive charge? How does positive charge in air induce negative charge on conductors, like the steel deck? If the positive air is attracted to the negative deck, why doesn't it recombine with and neutralize the deck and itself? And it doesn't take much electric force to overpower gravity, and get hot air, which ordinarily would have risen due to its buoyancy, to be held down to the deck. So you have air that has a build-up of thermal potential, which will rise if given the chance, but the electrostatic potential is offsetting the thermal potential, and holding the air down to the deck. I can understand that part, except for what prevents charge recombination. Now, reach over to the welding machine next to you, grab the whip, and dial up a negative charge to the tip of the whip, and point it at the deck. If you don't dial up enough voltage to get an arc between the whip and the deck, you'll still get a flow of electrons as a dark discharge. These electrons will be attracted to the positively charged air, and they'll burrow their way through the neutrally charged air to get down to it. On arrival, the electrons will neutralize the positively charged air, which will then be free to ascend, due to the buoyancy of hot air. Now you have an updraft. Is the welding machine's arc meant to be analogous to lightning? Maybe not, since you say dark discharge. Air will then converge along the deck toward [the base? of] the updraft, to replace the air that rose. When it gets to where the electron stream is, it will get neutralized too, releasing it from its electrostatic attraction to the deck, enabling it to rise as well. So now you have a sustained updraft, and a sustained convergence of air moving horizontally across the deck. But then does there need to be sustained lightning or dark discharge? If the horizontal inflow to the updraft is asymmetrical, a vortex will form, so the updraft will spiral around the axis of the vortex as it rises. Interestingly, the evacuation of matter in the core of the vortex makes it a better conductor. So the electrons flowing down from the welding whip will prefer the vortex as a conduit to get to the positively charged air clinging to the deck. This enables even more current to flow, and thus even more positively charged air can get neutralized and join the updraft. Would trees, hills, buildings, or other obstacles cause the horizontal inflow to become asymmetrical? It sounds like the evacuated core is a lightning channel. Right? Or do dark discharges have similar channels? The enhanced electric current through the vortex also generates ohmic heating, which further increases the buoyancy of the updraft in the vortex. So electric currents and fluid dynamic vortexes are mutually enhancing. Finally, the air skidding along the deck picks up even more heat due to skin friction. So when it gets neutralized by the electric current inside the vortex, it will rise even faster. Thus a vortex has been formed on top of the steel deck, just by the neutralization of positively charged air flowing downward, and once formed, the vortex and the electric current are self-stabilizing. I'm not clear on the meaning of self-stabilizing here. This will continue until the supply of positively charged air runs out, or the supply of electrons to the welding whip is shut off. And notice that we didn't need any sort of updraft over our heads to kick this thing off -- it all started just with charge recombination. If you start with formation of the body of positive air, then it starts with charge separation. Doesn't it? This is analogous to tornadoes. There doesn't have to be a large rotating updraft inside the thunderstorm for a tornado to form, but the electric current inside the tornado was there every time somebody tried to measure it. And the current isn't going into the ground, or it would have left a mark, and which has never been found. So the current is going into the air itself. And the smell of ionized air is distinctive, and which has been reported frequently in the tornadic inflow. So that's positively charged air flowing toward a neutralizing current inside the vortex. Is the electric current mostly lightning, or dark current or something? What I said previously about moving air having lower pressure than stationary air may apply to hot air too, since hot air is in motion more so than cooler air, though the motion is internal. By the way, Charles, since you have wanted to inform the public or authorities about how to prevent tornadoes, have you worked out details for how to determine if a tornado will occur? Or are there too many variables? Nick Beggich claimed that HAARP and similar antenna arrays can heat the base of the ionosphere, causing it to rise locally forming an inverted bowl shape, which can be used to transmit signals to many locations on Earth. Also such signals are supposed to allow the air at such locations to form a low pressure area, I think, which can then produce rain, tornadoes, hurricanes etc. Do you know if any of that is plausible? Could EM signals of any frequency have enough energy to heat the air enough to produce a low pressure area and a weather disturbance? Above, I asked last night what would cause a mass of air to attain a positive charge. This morning I remembered what you wrote a few years ago about electrons having the potential to move a lot farther than nuclei when heated etc, so I suppose just heat would be enough to ionize an air mass and make it positive as some electrons leave the mass. Have you come across info on how much heat and what other conditions are needed? The real reason water is involved with storms isn't simple. Convection is one of those notions that people want to believe because it seems simple. Understanding water's *correct* role in the atmosphere is the most important concept for understanding storms and atmospheric flow, including jet streams and severe weathetr. Water's role in the atmosphere has to do with its surface tension, not convection. When you eliminate what is impossible your mind opens to consider what is implausible. People fight to maintain belief in an impossible explanation as long as it seems plausible. The real reason H2O is involved in storms and atmospheric flow seems implausible. Surface tension is not a simple concept. The spinning of microdroplets along wind shear boundaries is what maximizes the surface area of H2O in the atmosphere. This only occurs when one body of air is moist and the other is dry and when they are moving in different directions. And it only occurs just along this boundary. When you maximize the surface area of H2O you maximize the surface tension. The ensuing plasma-like qualities that emerge is the structural composition of vortices, the conduits of atmospheric flow, and this includes an inner slick surface that is the lubrication of atmospheric flow. (H2O surface tension is actually hydrophobic.) Most significantly, it isolates its contents from friction allowing it to accelerate down the length of a jet stream as a result of differential air pressure. accelerating the moist air that flows through them, sometimes reaching velocities hundreds of miles per hour. All storms involve vortices that are themselves connected to the jet stream, itself a vortice and itself located along a moist/dry wind shear boundary, the tropopause. Normally these vortices are unseen. Sometimes, however, when conditions dictate (tornado alley), boundary layers extend all the way to the ground. When they do vortices can extend all the way to the ground, observable as a tornado. People want to believe what is simple. When simple beliefs are shown to be false people experience cognitive dissonance. Water's role in the atmosphere has to do with its surface tension, not convection. This explains why storms are wet. It also explains how heavier moist air is pulled up higher, to the top of the troposphere. Moist air convection and H2O ‘latent heat” are bogus notions that have nothing to do with what actually happens in the atmosphere. Lloyd wrote: Nick Beggich claimed that HAARP and similar antenna arrays can heat the base of the ionosphere, causing it to rise locally forming an inverted bowl shape, which can be used to transmit signals to many locations on Earth. Also such signals are supposed to allow the air at such locations to form a low pressure area, I think, which can then produce rain, tornadoes, hurricanes etc. Do you know if any of that is plausible? Could EM signals of any frequency have enough energy to heat the air enough to produce a low pressure area and a weather disturbance? Being able to disrupt and/or steer tornadoes was one of the design purposes of HAARP, and which was the reason they got partial funding from NWS. But to my knowledge, now that HAARP is up and running, they haven't bothered testing this capability. Eastlund, B. J., and Jenkins, L. M., 2007: Taming Tornadoes Storm Abatement from Space. Aerospace and Electronic Systems Magazine, 22(6): 16-21. Fiala, P., Sadek, V., and Kriz, T., 2008: Numerical Modeling of Electromagnetic Field a Tornado. Progress In Electromagnetics Research Symposium, Hangzhou, China, 1193-1197. Lloyd wrote: If you blow air between the balls, they move toward each other, because the moving air between them is lower pressure than the slower moving air around them. This is the Bernoulli effect. It is well known. It's aerodynamics. Aerodynamics are only possible with a surface. Plasmas provide the surface of the aerodynamics of tornadoes. There is no need to invoke electricity or ions. jimmcginn wrote: ...where, as you say, " . . . there is a concentration of energy release at the ground level, and this is where it gets its destructive power?" Notice that in fluid dynamics, where the vortex meets the solid surface, the radius is the widest, whereas in a real inlet vortex, the radius is the tightest at the solid surface. The difference is non-trivial -- the tighter the radius, the lower the pressure, and the faster the wind speed, meaning greater destructive power. So if these vortexes didn't get the concentration of energy at the solid surface from fluid dynamics, where did they get it from? That could only happen with the introduction of another force, which can only be EM. jimmcginn wrote: Now here's a question. What is the analogous equivalent of the engine with natural tornadoes? In both cases, it takes the introduction of another force to keep the air bound to the solid surface longer than it has a right. And the only non-Newtonian force strong enough to do this, and which is operative at the macroscopic scale, is the electric force. So the inflow has to be charged, for the air to be pulled by the electric force toward the solid surface. In the case of a thunderstorms, the charged air is a by-product of the charge separation within the storm. 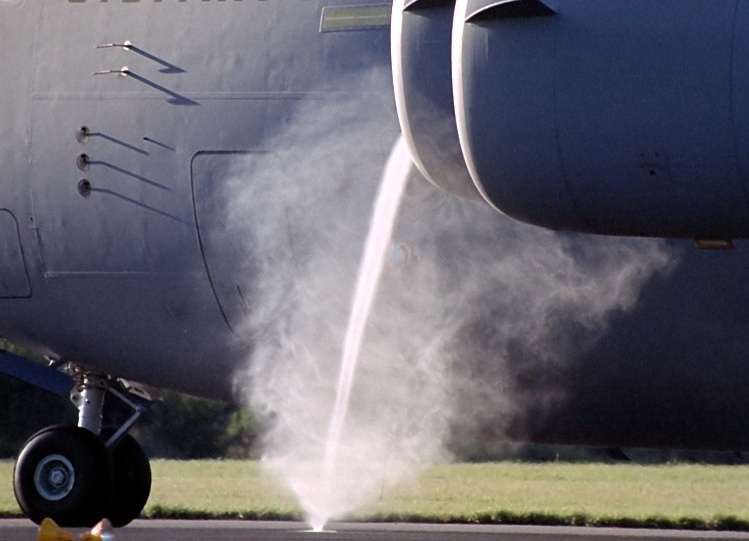 In the case of jet engine inlet vortexes, the ionized air comes from the exhaust from the engines, which is why inlet vortexes are more common when the reverse thrusters are engaged -- if the plane isn't moving very fast, the exhaust is redirected back to the front of the engine, though it clings to the ground because of the electrostatic attraction. Has this ionized air ever been measured? How is it you get from ionized air to vortex? What is the relation to wind shear in real tornadoes? Are you saying wind shear causes ionization of air? Do you have evidence of this or is it just a conjecture? jimmcginn wrote: Well, I"m not sure if i'm understanding the different views here. To me it seems obvious that the force holding the tail to the ground is suction--low pressure energy. And it is delivered in a spinning plasma (a vortice) that acts as a conduit for its high energy (high velocity), low pressure contents. This capability is afforded by the high surface tension of water. And the fact that H2O's surface tension is maximized under wind shear conditions. Other than the fact that it is involved with all chemistry (including hydrogen bonds betweeen H2O molecules--and plasmas) I see no need to conjecture a special role for electricity in all of this. Sure, Newton didn't know about electricity. But he didn't know about hydrogen bonding (H2O polarity) either. Nor did Einstein. Nor did Feyman. Charles, do you think the cone of a tornado is created by electricity? Do you have your own explanation? I agree that a tornado is a suction vortex. But in no sense does a suction vortex require plasma, much less the plasma of a specific compound such as water -- vortexes occur in any fluid (liquid, gas, or plasma), and in any combination of elements and/or compounds. The "sheath" that projects the low pressure away from the source of the low pressure, and which will ultimately latch onto a solid surface, is just the centrifugal force of the rotation, which prevents the inflow from getting into the core. What you are suggesting here is impossible. Obviously the sheath must be composed of a substance that has higher internal coherence than the contents that flow through it. In other words, if there isn’t a difference in viscosity of the composition of the “sheath” and the airflow contained therein the sheath couldn’t possibly, to use your words, project the low pressure away from the source of the low pressure. A container must be stronger than its contents. The only solution is to envision the factors that increase the viscosity of the substance that comprises the sheath. CharlesChandler wrote: The centrifugal force of air can be calculated, given its mass and speed, and the results match laboratory measurements of non-tornadic suction vortexes to within a couple of percents. 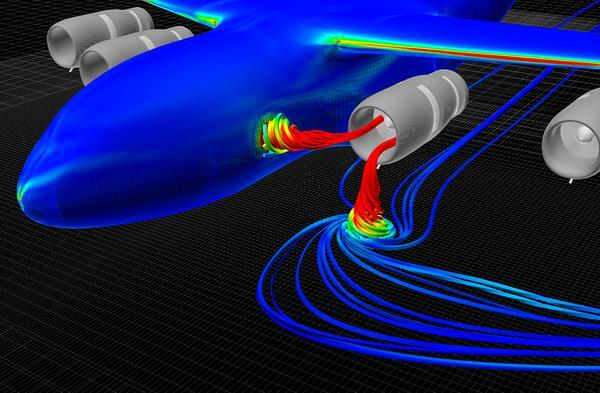 CFD simulations do this regularly, without calculating the effects of surface tension in any condensate that might appear, and such simulations are used reliably in all types of engineering applications, including aerodynamics, naval architecture, pump design, etc. Vortexes occur all the time, and are no mystery to those who understand the Newtonian principles that are being instantiated. You are drawing parallels between spinning air and vortices to no good effect. These are two different things that you are conflating into one. Spinning air cannot project its torque over long distances, as we see in vortices. Also, vortices have a structure that is plainly visible when not obstructed by debri. Could the work of Dr. Gerald Pollard involving E Z water, or the ability of charge separation to exist in water, have any bearing on this subject ? jimmcginn wrote: Has this ionized air ever been measured? The crucial study has never been done, so this is something that I have been trying to organize. Perhaps we'll get it done during the 2017 tornado season. The assertion is that the tornadic inflow is positively charged, to at least 1 ion in 100 million neutrals. The instrument to measure this is the Gerdien Tube, which we intend to add to a deployable instrument pod also containing an anemometer, barometer, hygrometer, thermometer, and one or more video cameras. But there has been plenty of indirect evidence that has been collected. For example, when a tornado is in the vicinity of an electric field meter, the polarity of the ambient E-field flips, from negative charge aloft, to a positive charge aloft. This happens in less than 20 minutes, and stays that way until the tornado passes, whereupon the polarity flips back. Meanwhile, the charge structure of the storm doesn't change, with its negatively charged base just 1 km above the ground, leaving the polarity inversion unexplained. So this is an indirect measure of the presence of the introduction of another body of air between the ground and the cloud -- the tornadic inflow -- which would have to be positively charged to have that effect on the ambient electric field. jimmcginn wrote: How is it you get from ionized air to vortex? I don't understand the question. In the presence of a vortex, the air would be drawn toward it, ionized or not. I'm saying that because it's ionized, the vortex takes on a new property set that isn't possible in fluid dynamics, such as the tight radius on the ground. jimmcginn wrote: What is the relation to wind shear in real tornadoes? Do you mean the wind shear between the layers above and below the cap layer? Or the classic curved hodographs? jimmcginn wrote: Are you saying wind shear causes ionization of air? No -- the ionization results from the same charge separation that produces lightning. jimmcginn wrote: Do you have evidence of this or is it just a conjecture? There's plenty of evidence, which I'd be happy to discuss. But I seem to have come to unique conclusions as to the significance of it all. IMO, there is only one way to assimilate all of the data into one model, and that's with charged inflow that gets neutralized inside the vortex. CharlesChandler wrote: I agree that a tornado is a suction vortex. But in no sense does a suction vortex require plasma, much less the plasma of a specific compound such as water -- vortexes occur in any fluid (liquid, gas, or plasma), and in any combination of elements and/or compounds. The "sheath" that projects the low pressure away from the source of the low pressure, and which will ultimately latch onto a solid surface, is just the centrifugal force of the rotation, which prevents the inflow from getting into the core. No, vortexes don't need "sheaths" made of different stuff. With any angular velocity at all, there is some point nearing the axis of the vortex where the centrifugal force in the inflowing fluid becomes equal to the centripetal force, since the centrifugal force increases faster than the centripetal force with decreasing radius. When those two forces match, the fluid can get no closer to the axis. And if the fluid can't ever actually get to the axis, there is nothing the relieve the low pressure there. Thus the low pressure goes unsatisfied, and projects away from the source of the low pressure, until hitting a solid boundary. The "container" is just the centrifugal force. jimmcginn wrote: You are drawing parallels between spinning air and vortices to no good effect. These are two different things that you are conflating into one. Spinning air cannot project its torque over long distances, as we see in vortices. Also, vortices have a structure that is plainly visible when not obstructed by debri. I'm not sure what you mean by "spinning air". I'm talking about suction vortexes, which of course are spinning, which means that the Newtonian factors have to be taken into account. But vortexes certainly don't have to have a visible structure. For example, wingtip vortexes occur all of the time, but only rarely become visible if the plane flies through a dense layer of fog. jacmac wrote: Could the work of Dr. Gerald Pollard involving E Z water, or the ability of charge separation to exist in water, have any bearing on this subject ? That only works within a liquid, while a thunderstorm is a gas (or a weakly charged gas -- a plasma) with liquid particles embedded in it. I still don't see how a gas or a plasma could have any surface tension, as this is a function of the covalent bonds within the liquid, and is not a factor between particles embedded in a gas or plasma. Charles, if you get time to comment, there's just a couple of things I'm unclear about in what you wrote above. I think I understand how an air mass can get positively ionized just by getting heated, so that some of the electrons get too energized to stay in the mass. But I don't understand how the positive air mass can induce a negative charge area below it on the ground surface. And I don't see what keeps the positive air mass from being neutralized by the negative ground before the dark mode electric current above or around the air mass can reach it. Lloyd wrote: I think I understand how an air mass can get positively ionized just by getting heated, so that some of the electrons get too energized to stay in the mass. But I don't understand how the positive air mass can induce a negative charge area below it on the ground surface. And I don't see what keeps the positive air mass from being neutralized by the negative ground before the dark mode electric current above or around the air mass can reach it. The ions are not manufactured by heating -- they're manufactured by the charge separation process above the freezing line within the thunderstorm. It's the same mechanism that produces lightning. But before the potential builds up to the point that an arc discharge can occur, it builds up to where there are charged bodies of air. So it's air that doesn't get neutralized by lightning that can produce tornadoes. As concerns the induced charge in the Earth, this always happens when a charge is put next to a conductor. In this case, the positively charged air repels positive charges and attracts negative charges within the conductor, and because it's a conductor, the charges can move around to suit, resulting in a negatively charged surface that will attract a positively charged body of air. These charge separations in a thunderstorm will eventually neutralize themselves by dark discharges, but it takes tens of minutes for the electrons to work their way past all of the resistance. Within the timeframe of the thunderstorm, the charge separation can build up to the point that arc discharges become possible, and if those are possible, the effects on tornadoes with lesser charges are definitely possible. I believe jet streams are tubes of water based plasma that provide isolation from atmospheric friction and this is what enables the high wind speeds of the jet streams. The water based plasma of my jet streams is an implication of H2O's surface tension and the fact that spinning microdroplets (the spinning sustained by the wind shear of the flow itself) maximizes surface area of H2O and when you maximize surface area of H2O you maximize surface tension. And since H2O surface tension is itself hydrophobic this provides a slick surface that can move moist air at very high speeds due to the reduction in friction of the hydrophobic surface and the isolation of the contents of the tube from the rest of the atmosphere. Conceptually my thinking pivots off of a statement my Edward D. Lorenz in 1967 to the effect that there is missing lubrication in the atmosphere. Well, I think I have found it. It is the jet streams. And the reason the jet streams exist on the boundary between the troposphere and the stratosphere is because the boundary must be moist on one side (troposhere) and dry on the other (stratosphere) in order to sustain the spinning of the microdroplets that produces the maximization of H2O surface tension that produces the plasma that spins up into the tubes that are the jet streams and other related tubular atmospheric phenomema, like tornadoes and hurricanes, which themselves are the wildly whipping tails of a much larger and more benign dog, the jet streams.